There are two ways, I think, we should read the Bible. One is to study it deeply. This means choosing a chapter or a couple of verses at a time and reflecting on each word carefully. The second way is to read it in a more general fashion, like how you’d read a novel. The first way is to get you to understand fully what each specific author wanted to get across to his readers. The second is to get you intimately involved with the whole overarching plan of God. 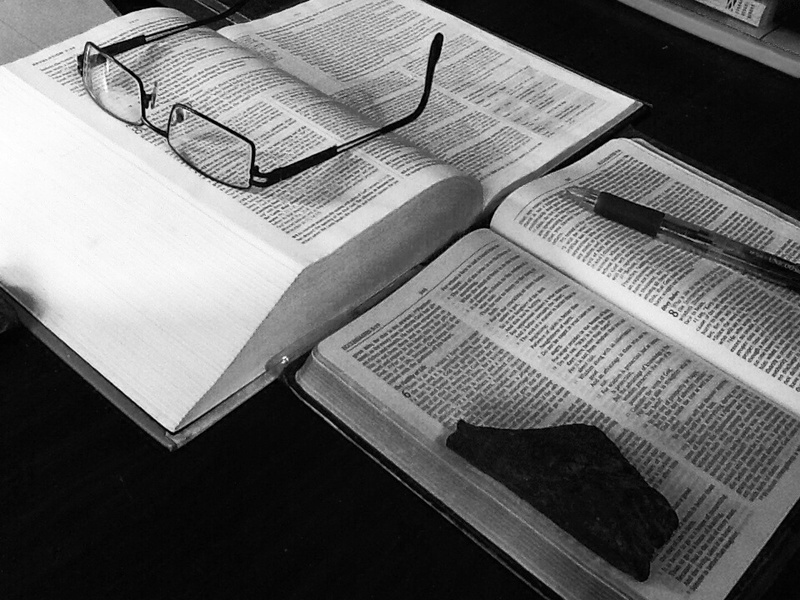 One handy way to deeply study the Bible is to use a Hebrew and Greek lexicon. This way you can look up the original meaning of the words you’re currently reading in English. I wouldn’t recommend getting too caught up in this though. The people who translated the different versions of the Bible were experts in the Greek and Hebrew, and so, took great care in getting the proper meaning of the original into English. But still, if you’re curious about a word, you can look it up, and you might be surprised at what you find. We read the word ‘adoption’ and assume that it simply refers to kids with no parents getting parents. But it means something different. The Greek word, ‘uihothesia’, means the establishing or setting in place a male child into the position of being a son. And what Paul was likely referring to is the Roman practice where a father would officially set his oldest son into the place of being the legitimate heir to the family. A male child didn’t automatically become an heir simply for being the oldest biological offspring, and the father could cast him out of the family if he wanted to. It wasn’t till the boy was older, and had proven to his father that he was worthy of the family name, that the father would officially name him the heir. Once the boy was set in place he had all the rights, privileges, and burdens of that family. He was seen as being one with his father and having the authority of his father. Now when we apply this analogy to the modern Christian, the term ‘son’ becomes gender neutral, and the ‘adoption’, or setting in place one as God’s heir who has rights and authority as His heir, appertains to all believers. This changes our understanding of adoption from being, “I was an orphan and now I have a daddy who loves me” to being, “I was not rejected by my Father, and now I have all the rights and privileges of being His son, His heir.” And when you begin to study what having His authority means, you will begin to understand how profound this ‘adoption’ really is. A tool I use for this kind of study is “eSword“. It is free for PC, and there is an app for iPad, which is not free, but I bought it and use it all the time. A tool I use for my general reading of the Bible is a reading plan called “Professor Grant Horner’s Bible Reading System”. This plan is designed to get you to read from all over the Bible each day. The plan suggests you read ten chapters per day, but you can set your own pace. Click here to read about the plan. I like this plan because it gives you a good bird’s eye view of the whole Bible and you will see scripture supporting scripture — all of the Bible tied together. Another tool is, as you’re reading the New Testament, when an author quotes an Old Testament passage, you may have a Bible which gives you what that OT verse is. For example, Paul, in 1 Corinthians 15:27, quotes Psalm 8:6. Now if you flip to the Psalm verse you won’t see in your Bible a reference to 1 Corinthians. So, write it there yourself. Now, every time you read the NT and see a reference to the OT, go to the OT and write in the NT verse yourself. Once you’ve done that for awhile you’ll find as you’re reading the OT all sorts of references to the NT. Why is this helpful? Because then you’ll have Jesus, Paul, Peter, John, and the other NT writers teaching you how to understand the OT passages. Every time you come across one of your written references in the OT to the NT, go and look it up, and the NT writer will tell you what that OT verse is really saying. Now, again, you have a tool to give you a clear overarching view of the plan of God. There are lots of good ways to read and study the Bible. I love studying the Bible and can spend hours doing it. These are just a couple of ways I do so. I just finished reading the entire Bible and was thinking about doing it again, but doing it chronologically. Have you ever done that? Thanks for the links. I’ll find my next tool very soon. Blessings to you. Yes. I also have a chronological Bible which is broken up into 365 daily readings. That one works good too if you can keep to the schedule.